In some new gameplay footage, the team behind Extinction have shown off what the game looks like, after a cinematic trailer went live earlier this month. It’s pre-alpha footage, and some messages make it very clear the game is nowhere near done, so expect the final game to be quite different. Want more indie games? We’ve got a list of the best indie games available on PC, just for you. 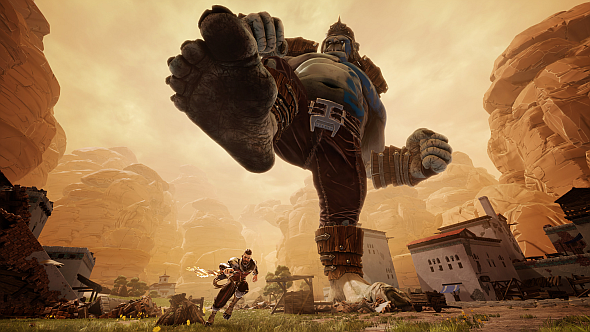 Clearly inspired by Attack on Titan, Extinction is all about saving humanity from giant ogres that are destroying just about everything humanity has left. As Avil, you’ve got to weaken the ogres, and eventually get up to their neck to slash the head off. Alright, yes, it’s almost exactly the same rules as Attack on Titan. Showing off some of the destructible environments, as well as a couple of ogre types, it’s hard not to keep comparing the game to Attack on Titan. There’s a whole lot of gore, fleshy limbs trying to smush you up, and parkour around a town. That’s not necessarily a bad thing, but we’ll have to wait and see how the game changes and tries to define itself as it progresses in development – at this pre-alpha stage, everything could change. They’re promising a main campaign, daily challenges, and custom battles, so there’s a lot more to be added. Extinction aims to release early 2018, so hopefully we’ll get to see more of it in the coming months.